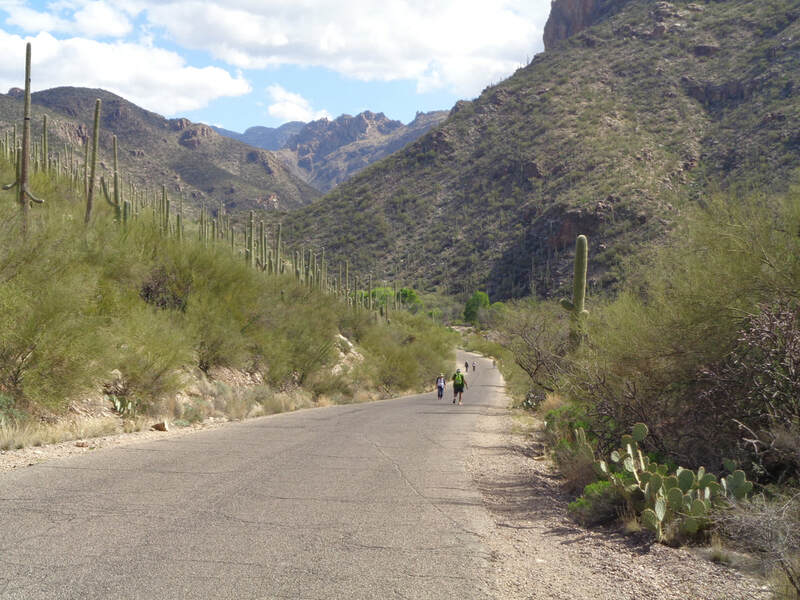 A must see on anyone's first visit to the Tucson area is Sabino Canyon. 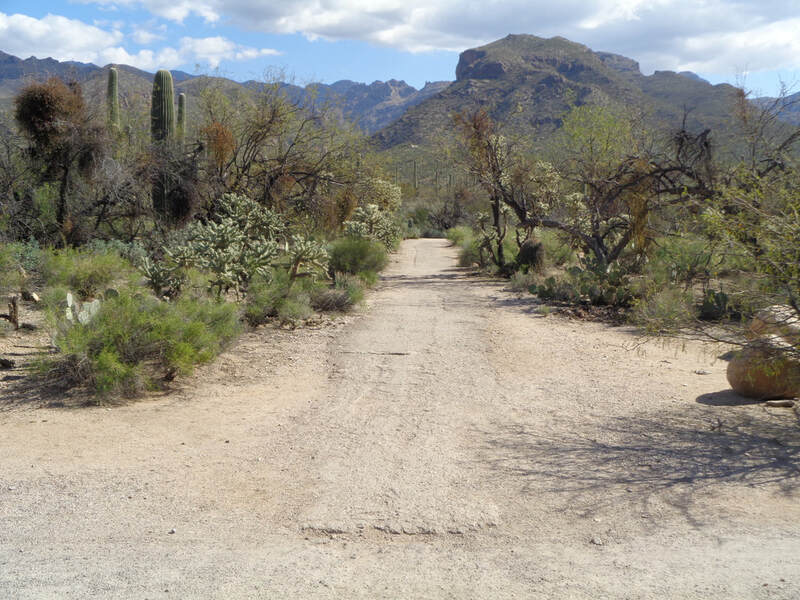 Go south on Oracle Road, turn left on Ina and just follow the road until it dead ends at Sabino Canyon Road. A left and then a quick right brings you into the parking lot. Note, Ina Road breaks off to the left but it is unlikely you notice, stay on the main route which becomes Skyline Road. It too breaks to the left but by staying on the main route again, the road becomes Sunrise Road. By turning left onto Ina off Oracle, then staying in the flow of traffic, you will have made the road changes without noticing. 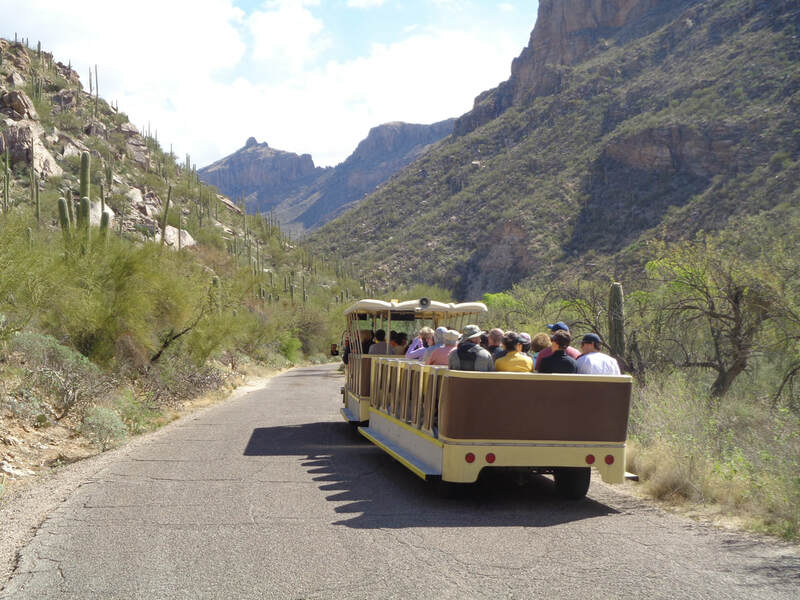 ....paying the modest fare, you will be directed to hop on the shuttle which takes you 4 miles into the canyon. It is open air so on cooler days, a jacket may be needed. The driver provides a narrative while pointing out features along the route. 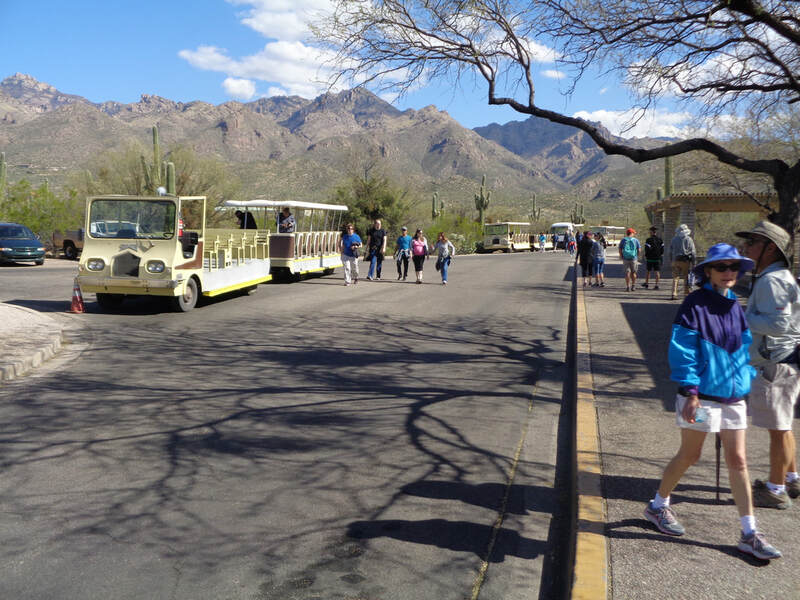 I enjoy taking guests on the tram and listen to the "ohs" and "awes" but otherwise, I use the paved road or a dirt trail which parallels the road, to provide access to trails and routes. I tell the balance of this report from the perspective of someone who is hiking but via the tram, you will see all that I show, up to the turnaround. 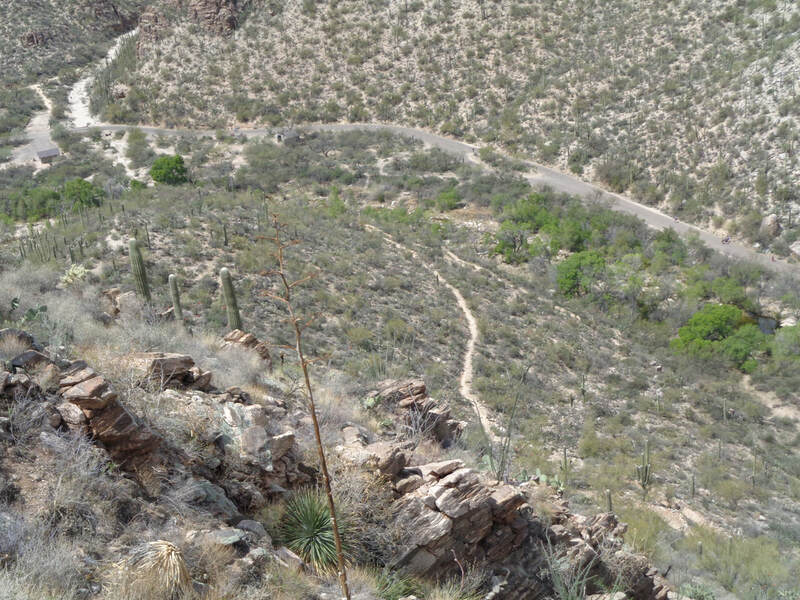 I prefer walking via the path because the features of the Sonoran Desert are much closer. 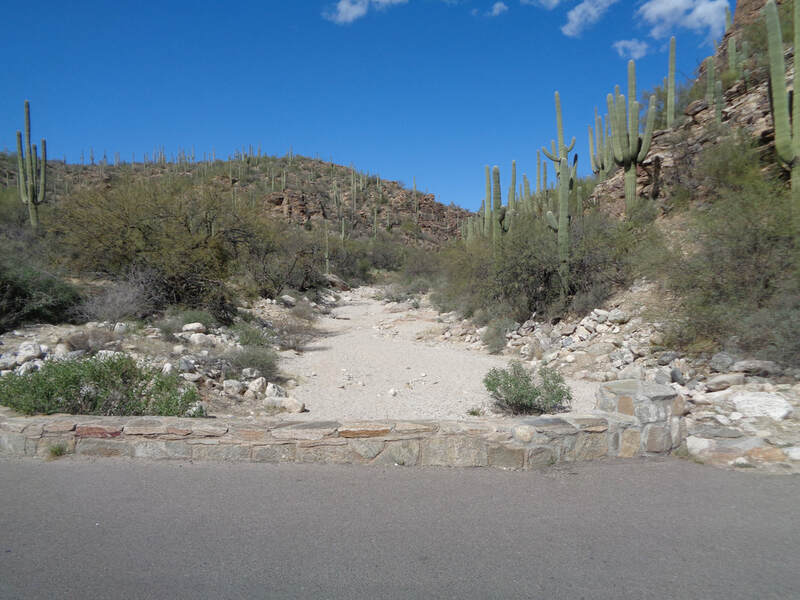 While walking the path, there are several points where you have the option of reaching the road and eventually, you will have no option but to do so. That point is obvious. Many people run or walk the road and cyclists can use it too if before 9:00am or after 5:00pm. 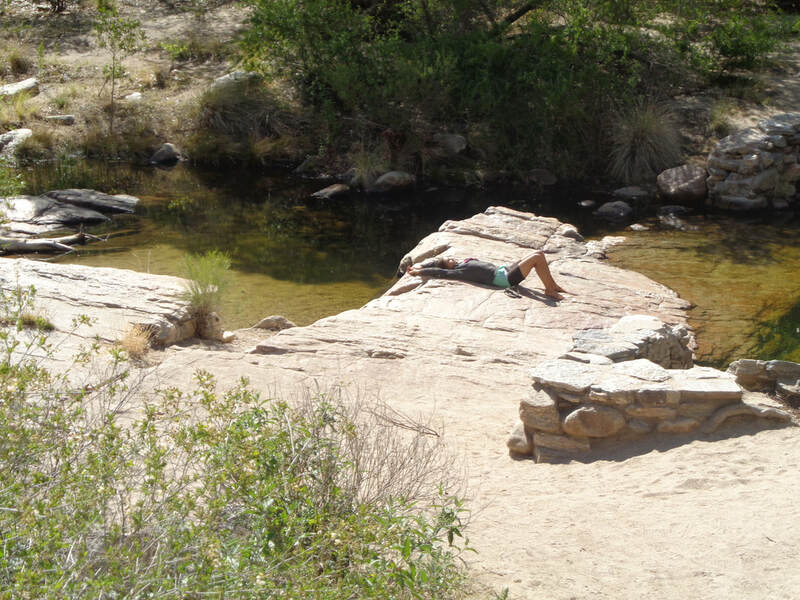 ....just jump into a sandy wash and explore. OK, stating the obvious, I am neither endorsing or encouraging you to bushwhack into the wilderness. The trails also can be dangerous. 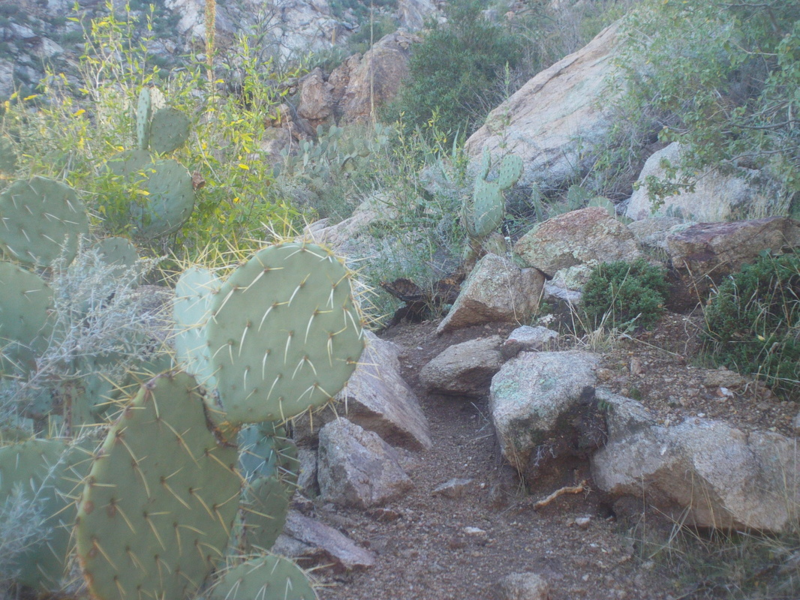 I have seen many rattlesnakes on or along the trails and in those mountains, there are mountain lions and other animals that could do you harm. You can also rather easily trip while walking. If you are not prepared for the rewarding but risky activity, don't do it. There are enough restrooms along the road that you are never far from one. A tram comes along every 30 minutes I think. On pleasant days, usually full. 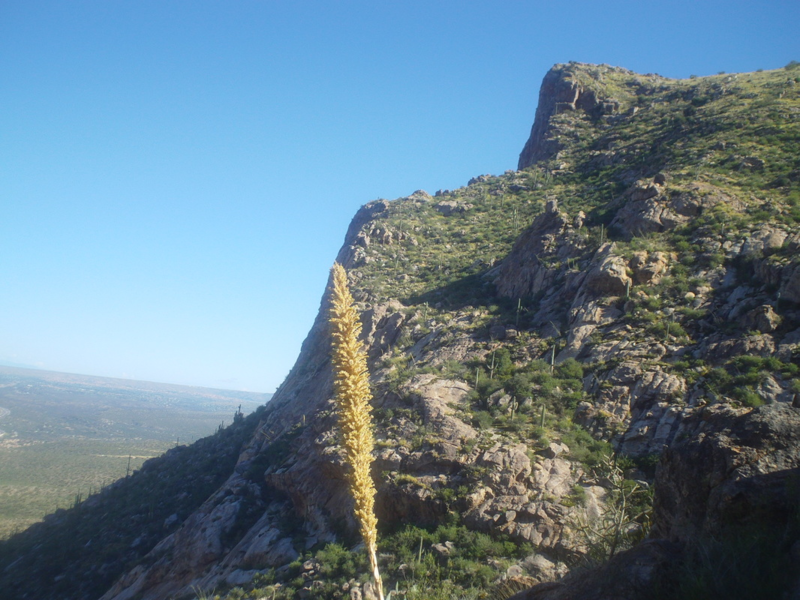 In the background, the prominent point, is Thimble Peak. Reaching the base of that and then climbing to the top is a thrill. 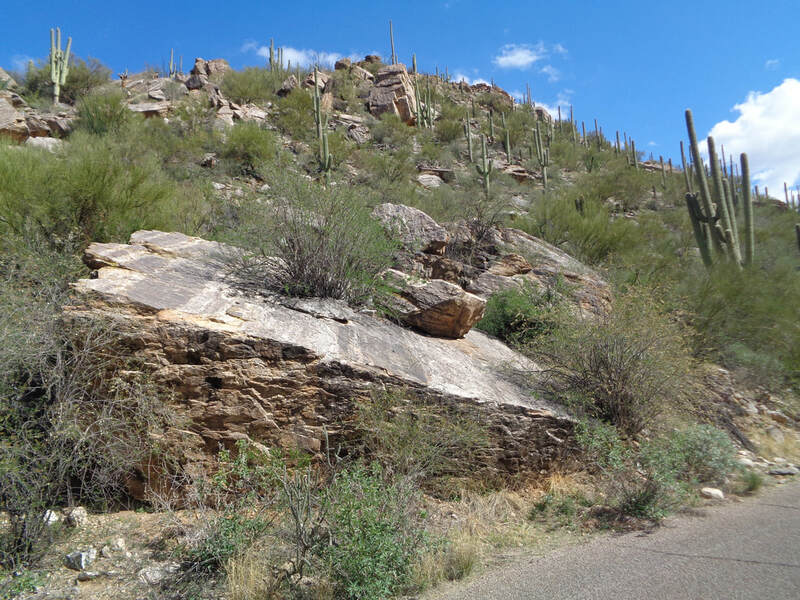 During your ride or hike, you will pass massive boulders, usually this is Catalina Gneiss, fallen from above. And yes, if you want to walk off the road and just lay in the sun, that too is ok. The shuttle will stop for you at one of several places along the way so if you want to depart the shuttle, let the driver know and you can rejoin on another but KEEP YOUR TICKET. You have to prove you bought a ticket so be allowed back on the shuttle. ....the river crosses the road. OK, see the rocks on the right, bordering the road? 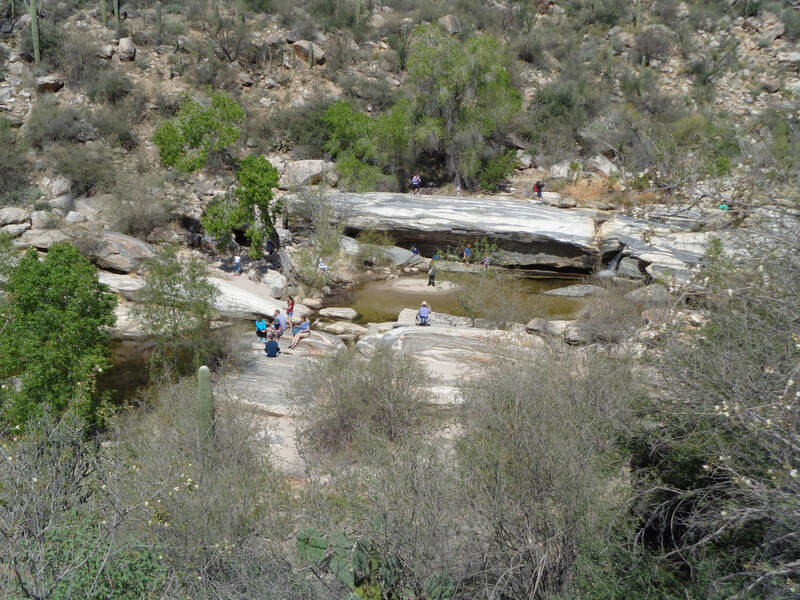 When wet, they are slippery so think it but don't do it (skipping from rock to rock to avoid getting feet wet). 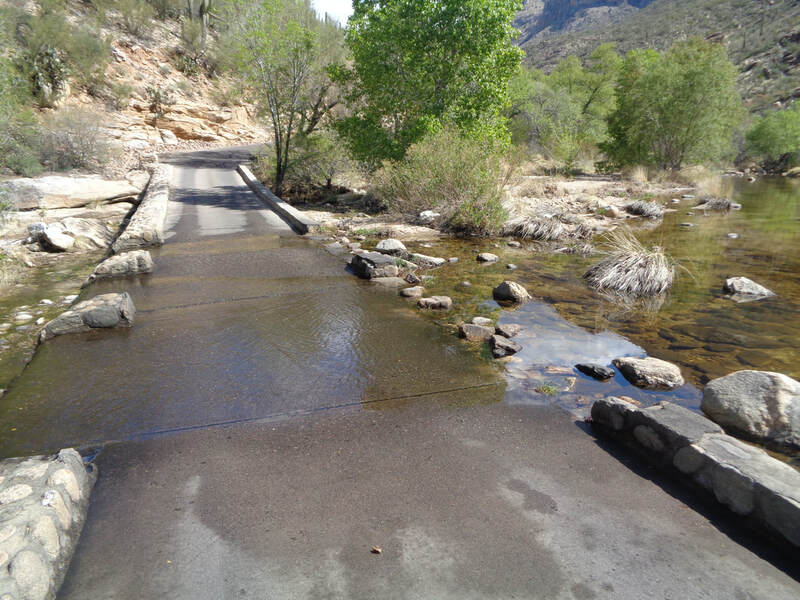 Again, yes it is permitted to walk off the road and explore but be careful. The staff can tell some colorful stories of rescues. ....awesome. 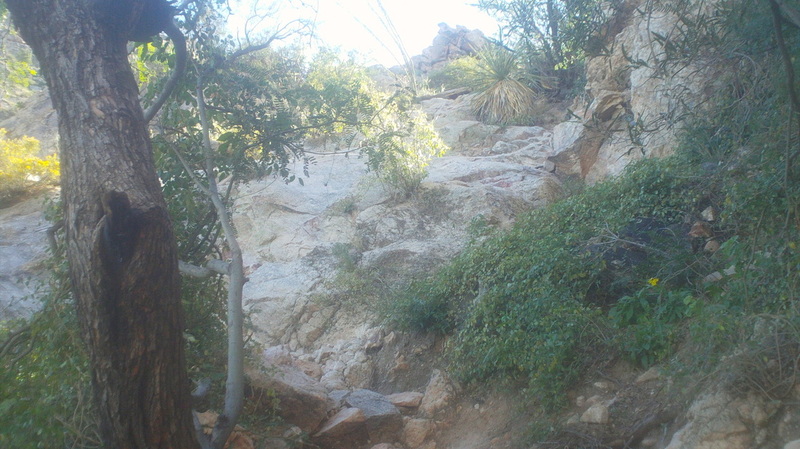 It is a longer hike back then the road because the trail moves in and out of side canyons. 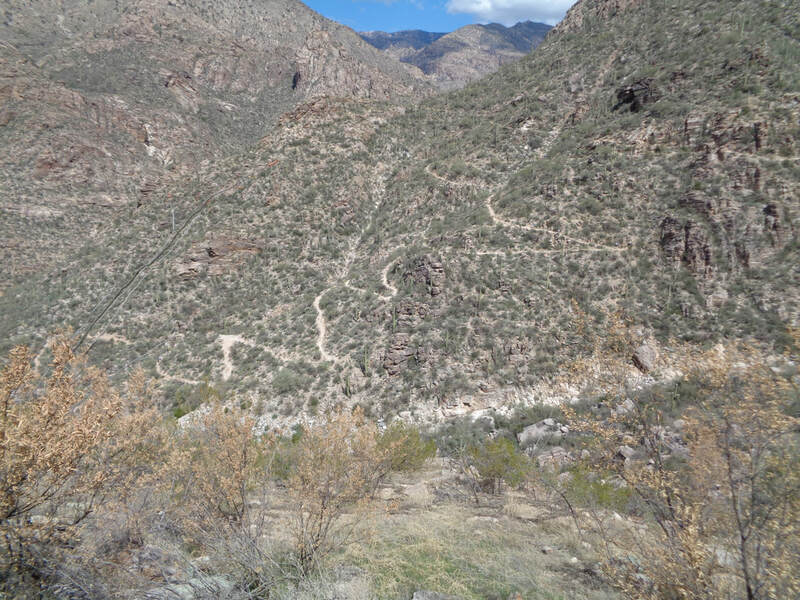 Far below is the road with a few options for returning to it. 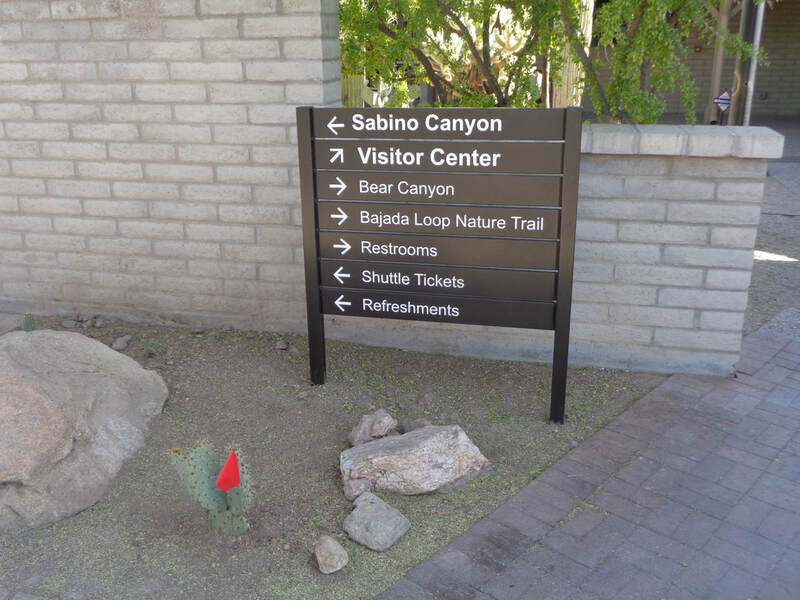 Check the hiking guide, found at the Visitor Center, to select your options. Today, my route was 9.7 miles prior to returning to the parking lot. Always take more fluids and snacks then you think you will need. Be careful. ....this junction. 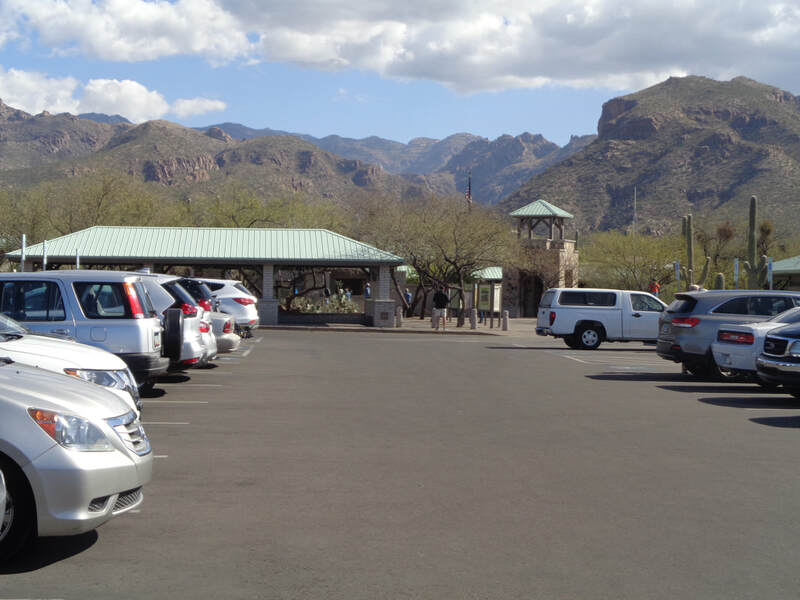 A right at the bridge provides access to Catalina State Park or Oro Valley Marketplace. 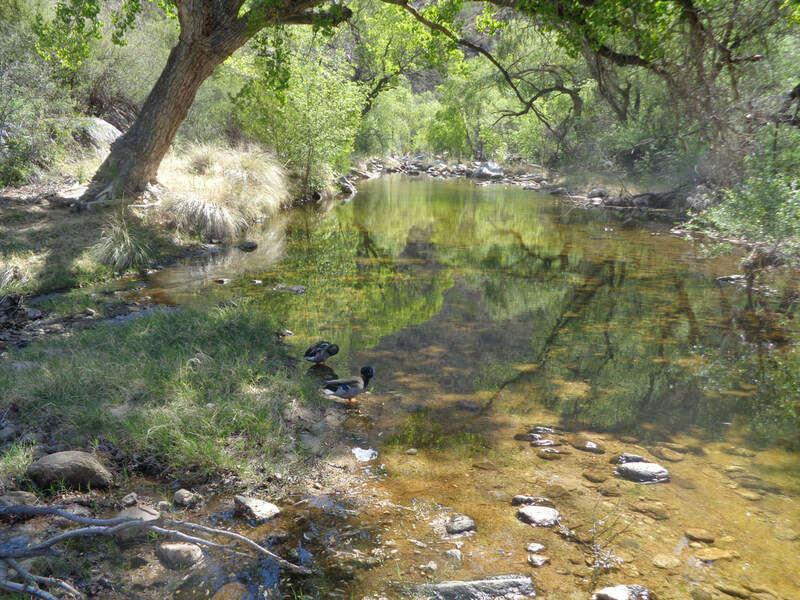 Staying straight you will follow the "Canada del Oro River Park" trail toward the southwest. 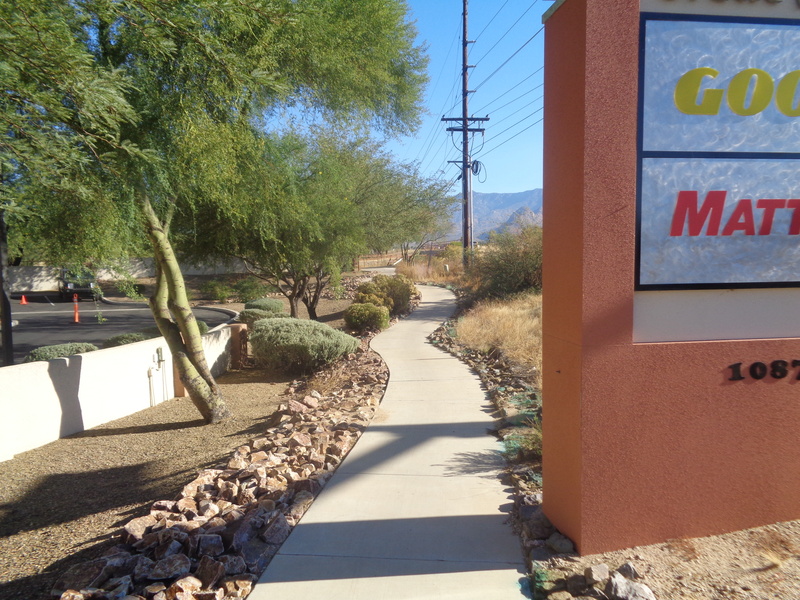 At about mile 9, you will cross under I-10 and from there you have 3 directional options. 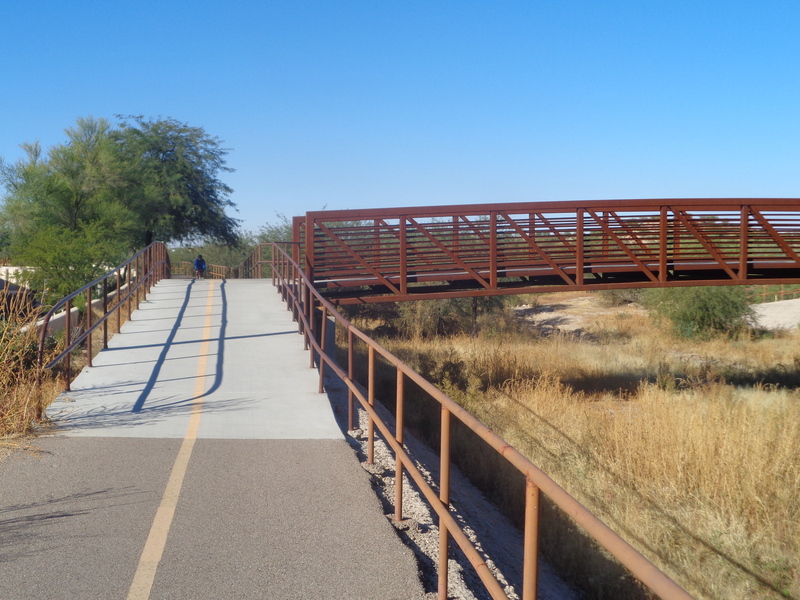 Consult the "Pima County Trail System Map" a copy of which can be found at area bike shops for more complete information. 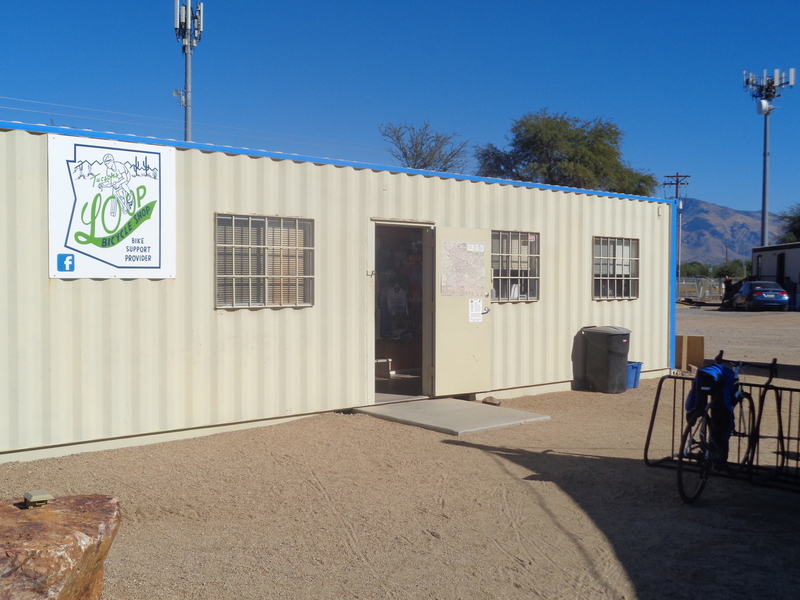 Heading southeast and getting on the "Santa Cruz River Park" trail will lead you to, at about mile 12, the "Loop Bicycle Shop" where you can refuel or shop for cycling related products. 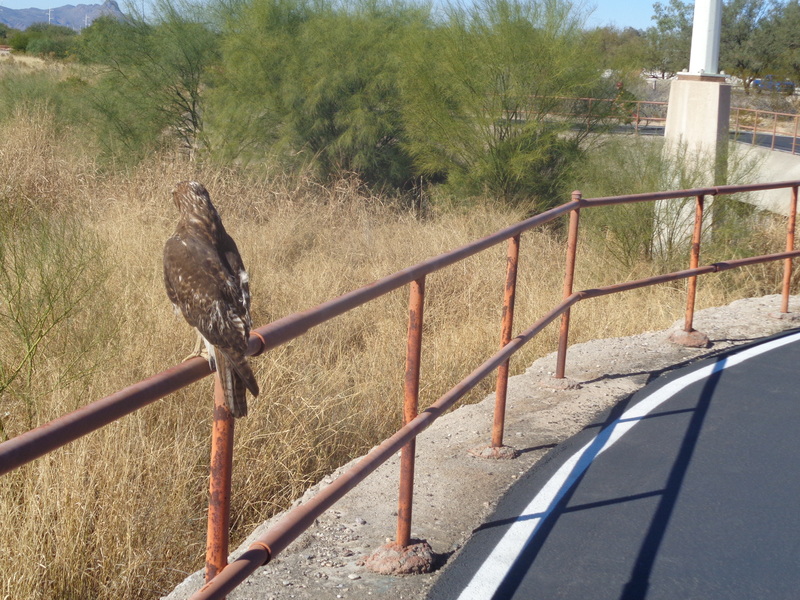 The bike path usually borders sandy washes which are not all that interesting but there are always views of the mountain ranges and of course, sometimes you'll get close to wild life too. 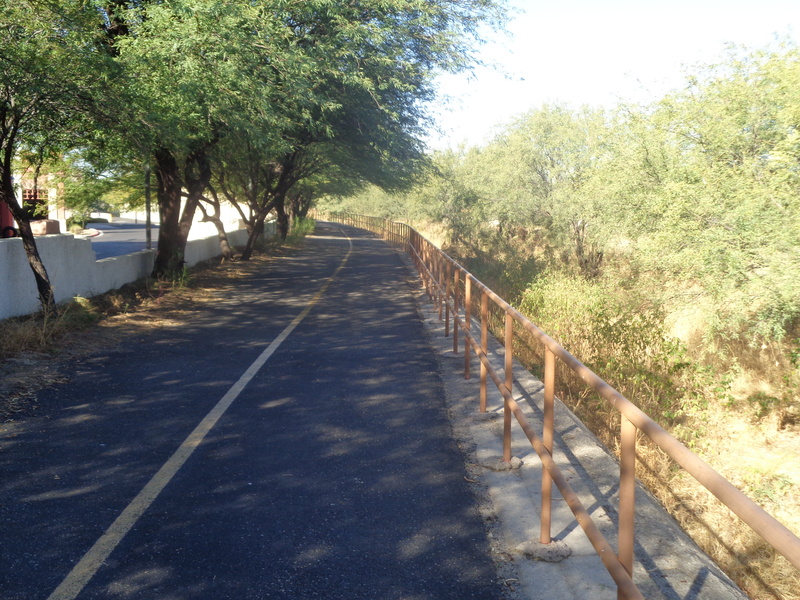 While Tucson area roads are generally in poor condition, the bike path's surface is flawless. Enjoy exploring! 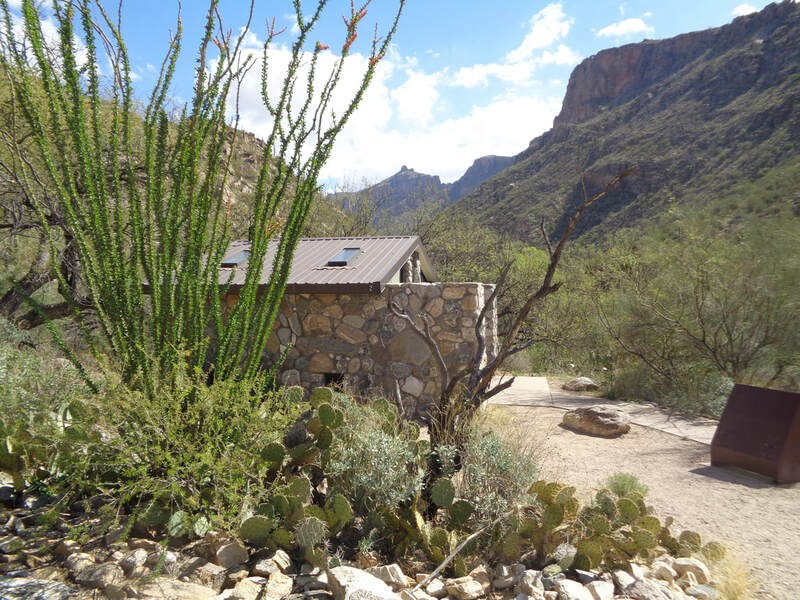 We are surrounded by beauty, which includes 4 mountain ranges (Tucson, Santa Ritas, Santa Catalinas and Rincons). 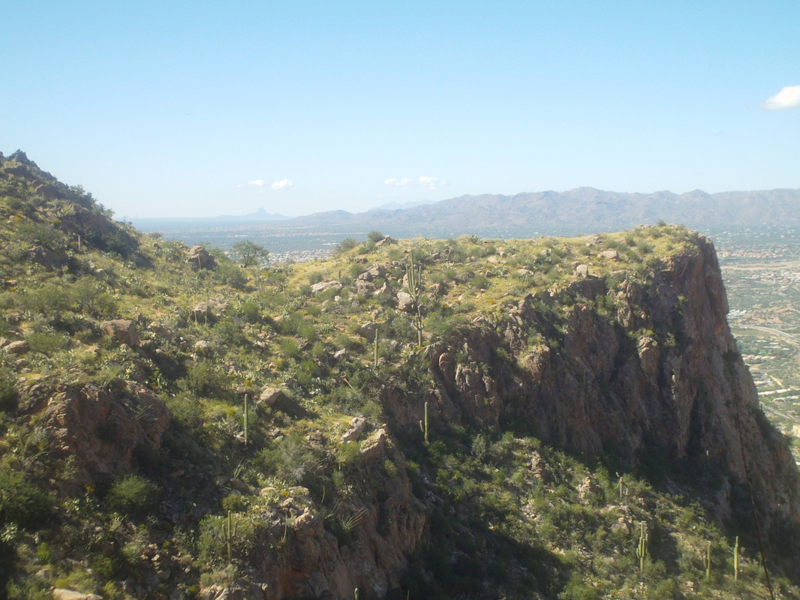 Our community sits on the western edge of the Santa Catalinas and what we see when we look to the east, is Pusch Ridge. 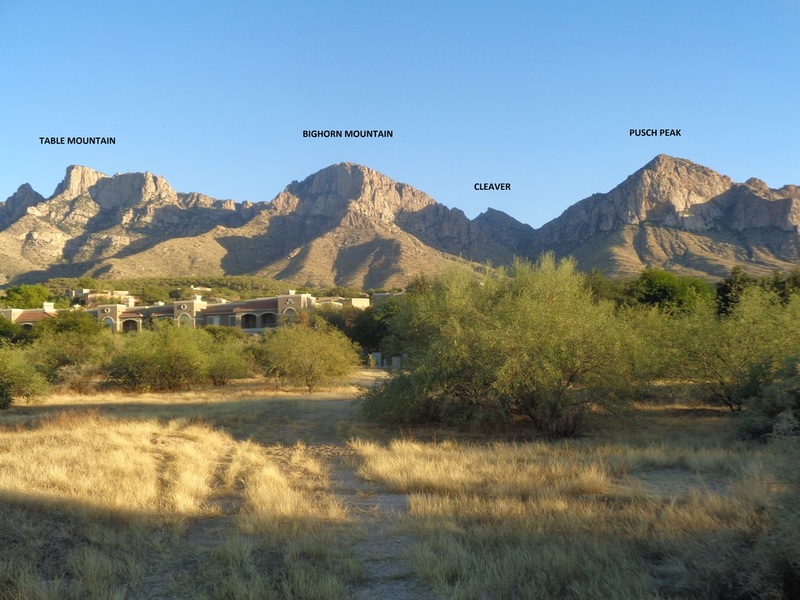 Pusch Ridge is dominated by 4 distinct peaks as shown above. 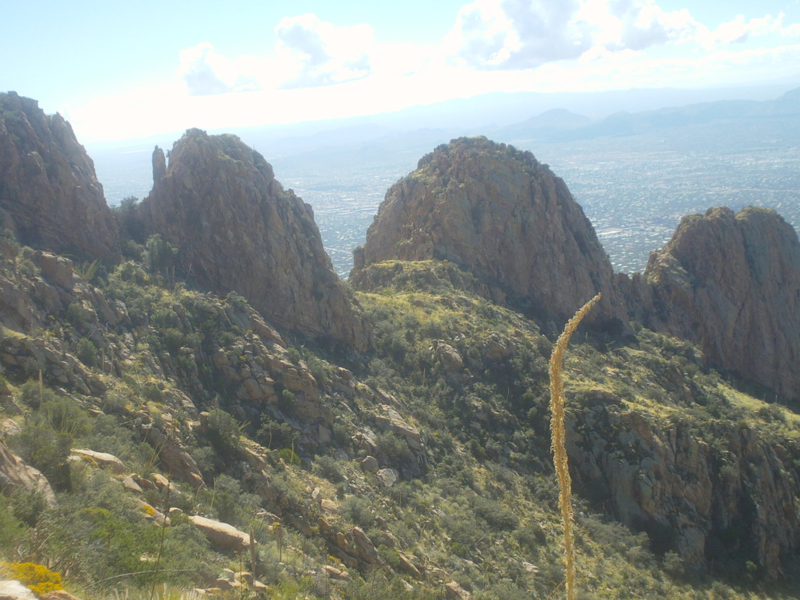 As beautiful as they are, when one stands at the top of each, the views are incredible. 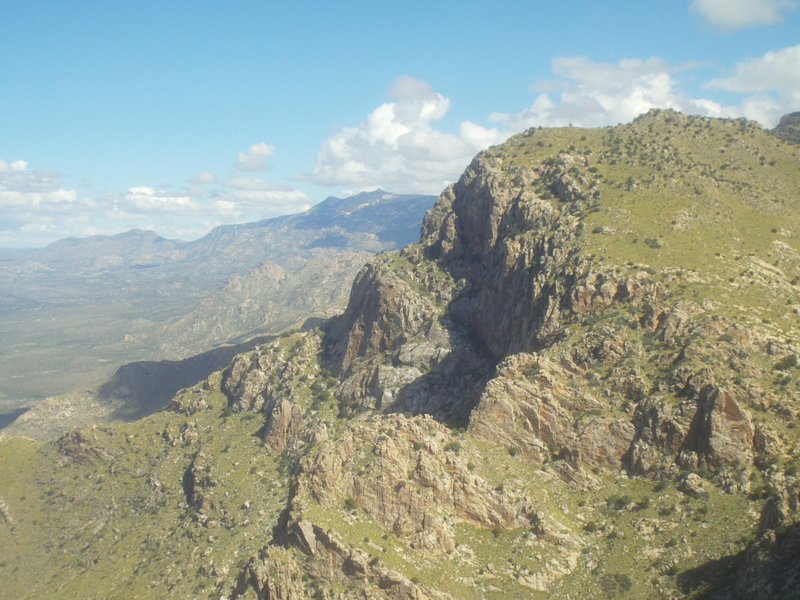 I have been fortunate to have hiked to the top of each, along with many of the other 50 peaks within the Catalinas. 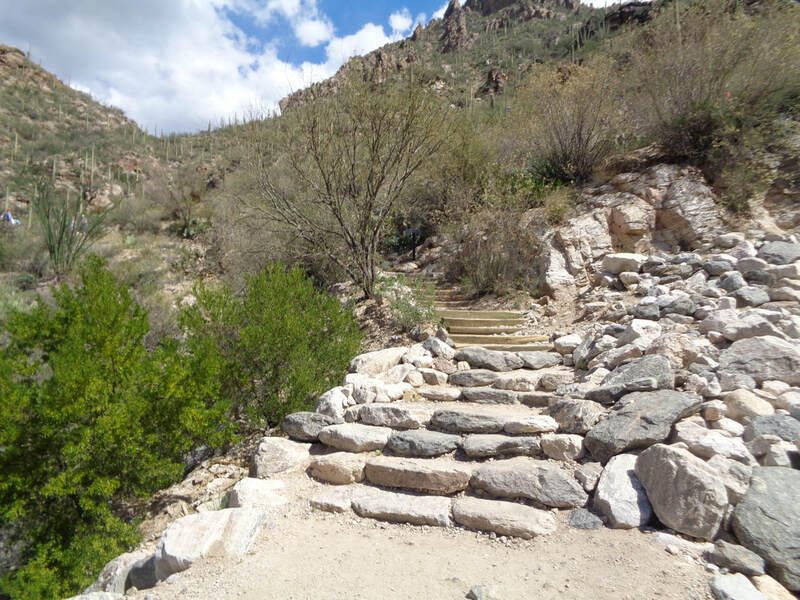 Below is information about the nearby Linda Vista Trail and an ascent to Pusch Peak. 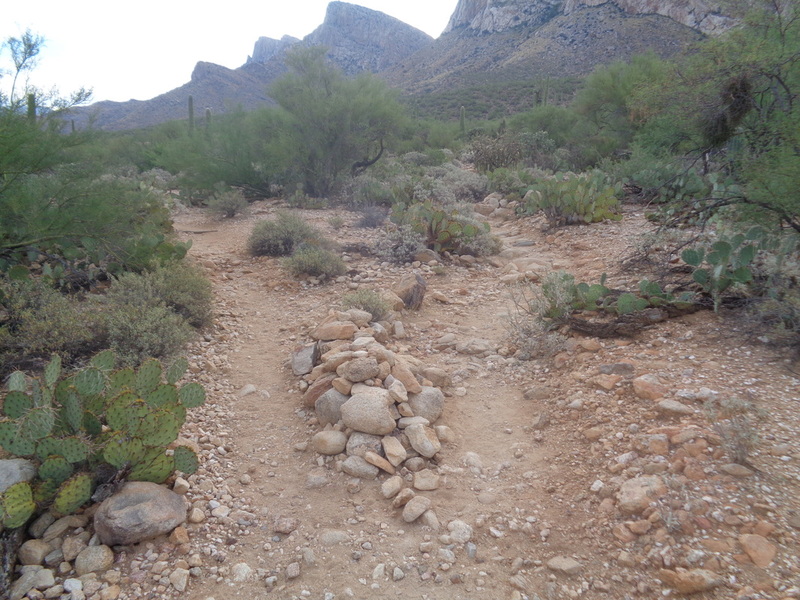 Approximately 2 miles from the entrance of East Pusch Wilderness Drive is the easily accessible "Linda Vista Trail". 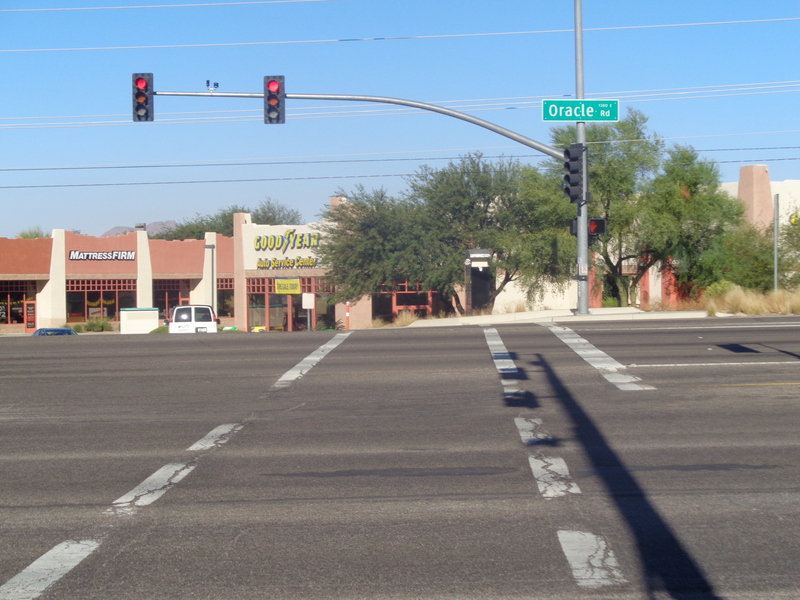 Turn left on Oracle Road, stay in the left lane and then make another left on E. Linda Vista Blvd. Trail head parking is a little ways on the right, past the school. 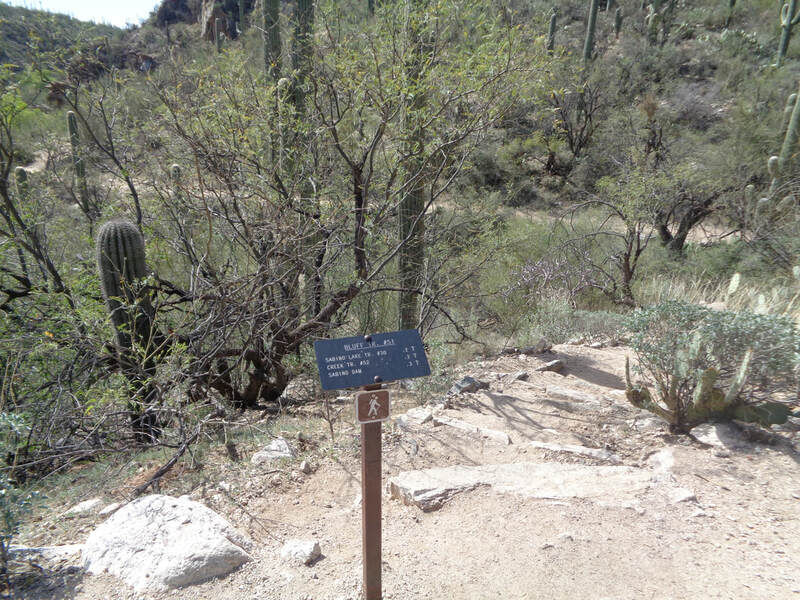 Other than providing access to a faint trail to Pusch Peak, there is a network of trails shown on the signpost. 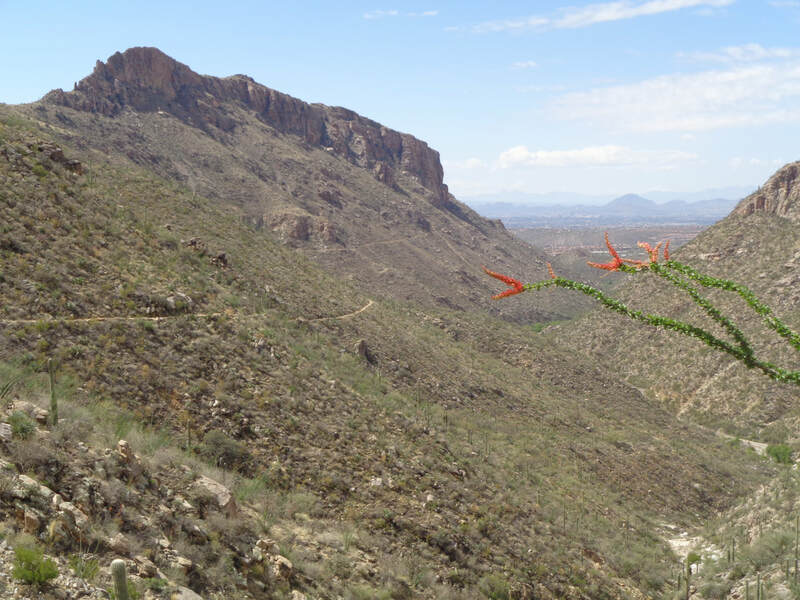 Opting for the perimeter trail, is a good, undulating way to expose oneself to hiking in the Sonoran desert with marvelous views to the southwest-northwest. 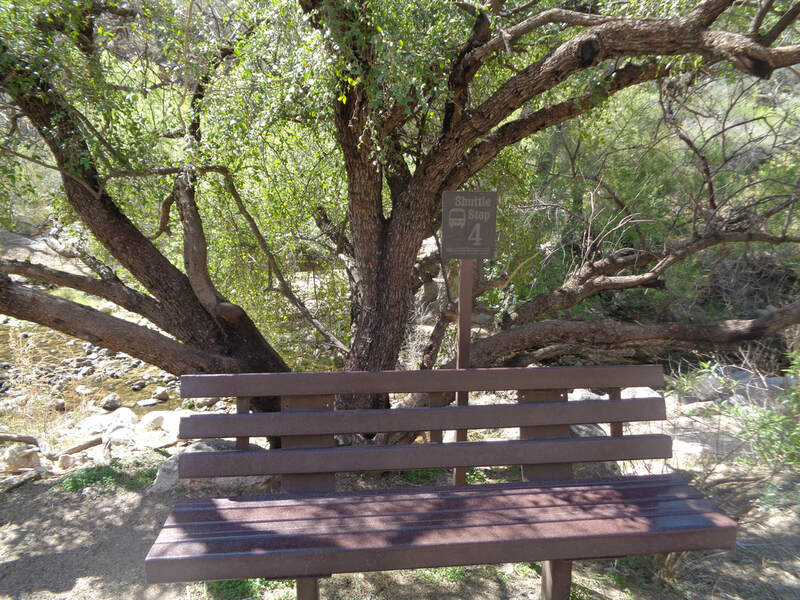 The perimeter trail is about 2.4 miles and easy to follow. Take plenty of fluids. For me, one liter is more than enough but more is always better than less, out here. 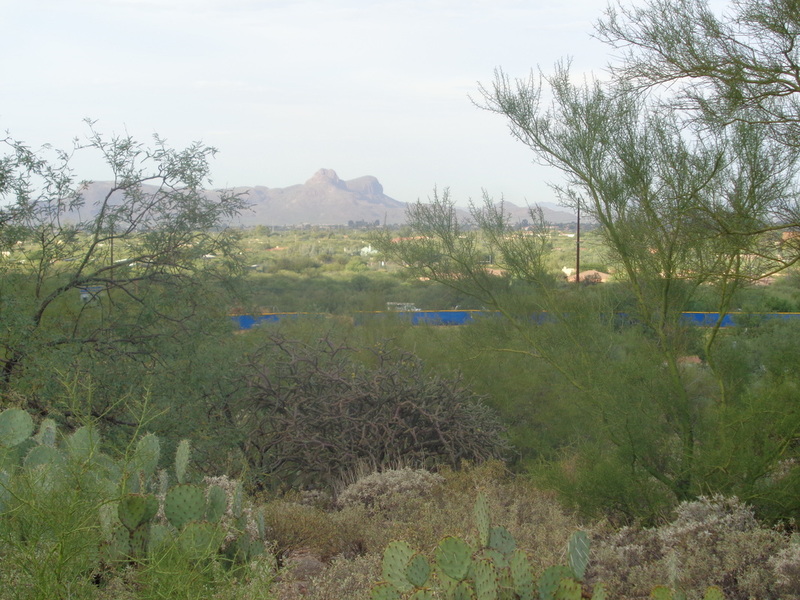 Within moments of leaving the parking lot, views begin to open, including the prominent peaks to the southwest, Sombrero and Panther. 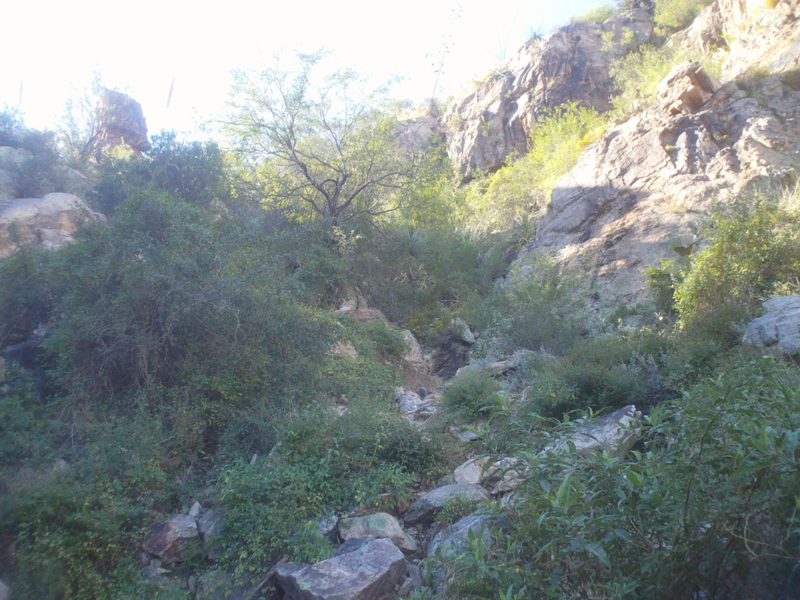 I go up the center of the perimeter, bearing right at this pile of rocks, eventually reach the back of the perimeter trail. Turning left I am almost immediately confronted with a sign warning that the faint trail emerging from the right, is not a maintained trail. True enough as it is overgrown and an ascent that I refer to as, "knee buckling". So far, I've been climbing at a moderate rate but what follows is very steep. 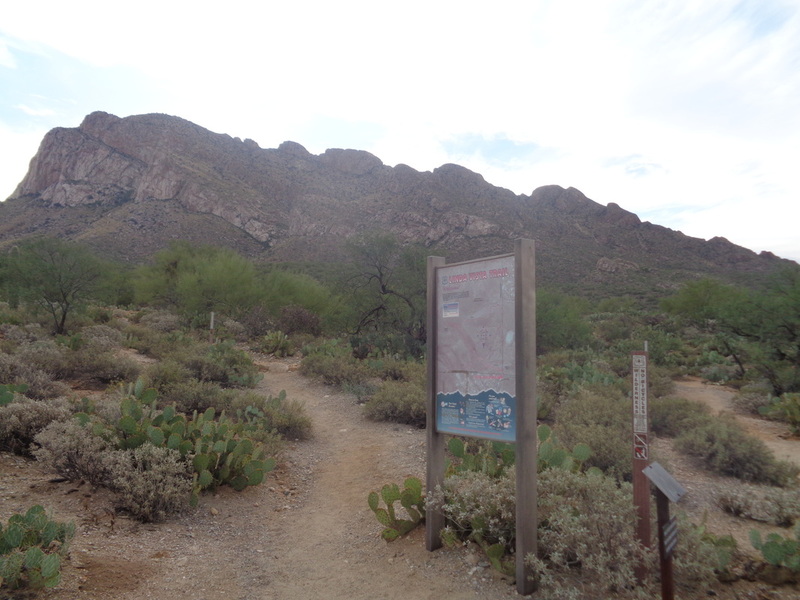 From the trail head, the distance to the peak is only 2.1 miles but there is 2600' of elevation gain. ....in some places, especially steep. This 15' wall is a lot of fun to scramble up and over. A sure sign that a trail has had little use, trail side cactus still have most of their needles attached. On frequently trafficked trails, the needles have been deposited in shins and clothing. A tip; carry tweezers with you when hiking. 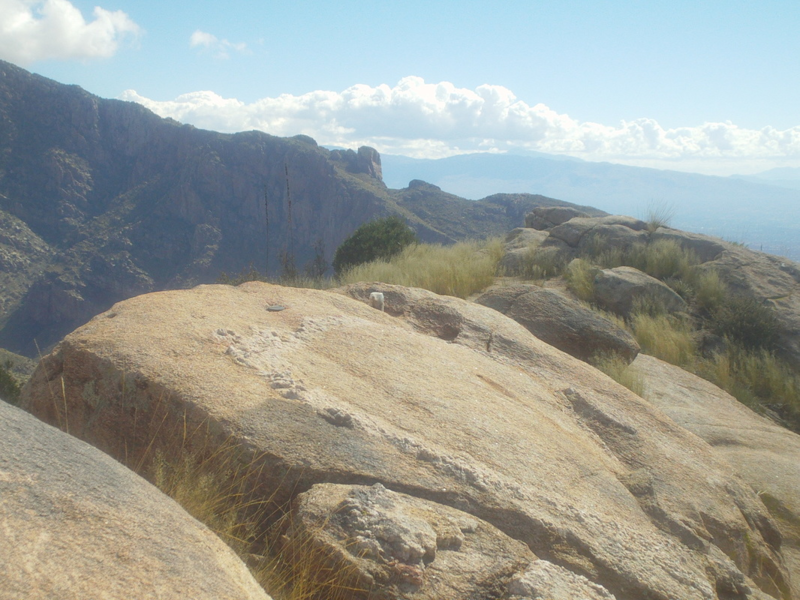 ....this prominent point with grand views. ....the peak. I've done this hike 6-7 times and sometimes there is a jar with a notebook inside, under a boulder where one signs their name with date. I always sign each peak register the same, "Go Buckeyes". That is Bighorn Mountain across the way. It looks close but requires a rigorous, off trail effort to reach. If you reach the top, take time to refuel and enjoy the 360' views. Take care during the descent and I find one hiking pole helpful to absorb the impact of down climbing.